New Construction built by Taralon Homes. 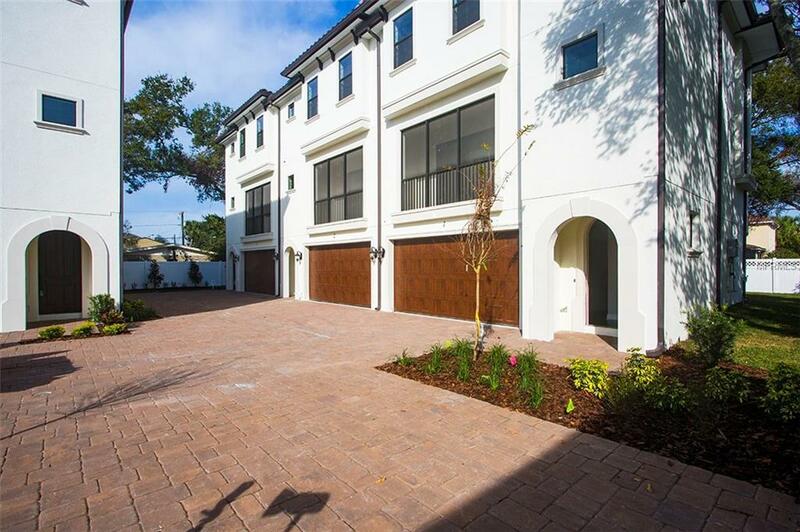 3 story townhome with 3 Bedrooms, 3.5 Bathrooms and 2578 SF of living space lives like a single family home, but with a maintenance-free lifestyle. Spanish Mediterranean style home offers 1st floor Study with closet, Game Room and a full Bath. 2nd floors open plan affords 10 ceilings. Dining Room is accessible to island Kitchen with Whirlpool double oven gas range, microwave hood, French door refrigerator, dishwasher and dual sink with disposal as well as HIS shaker style cabinets with 42 upper cabinets, soft close drawers/doors and Quartz countertops. Grand Living is prewired for surround sound and opens via triple sliding doors to a screened balcony with aluminum railing. 5" plank Naturally Aged Hand Scraped wood flooring included on the 1st and 2nd floors excluding tiled full baths and laundry. Carpeted third floor Master Suite offers French door entry, dual walk-in closets and Bath with twin sink vanity, soaking garden tub and glass enclosed step-in shower. Other amenities include Plant HS district, attached 2 car Garage, rustic Spanish style arch-top front door, 9 ceilings on the 1st and 3rd floors, security system with 3 keypads. Grand Living, Study and Bedrooms include structured wiring for phone, cable and computer networking. Energy Star windows, high efficiency Carrier heat pumps and tankless water heater keep this home energy efficient. All units are different, pictures are representative of one unit. Additional Lease Restrictions No Owner May Lease A Townhome Without The Prior Written Consent Of The Association. Pet Restrictions No Animals Livestock Or Poultry Of Any Kind May Be Raised Bred Kept Or Permitted With The Exception Of Dogs Cats Or Other Common House Pets But No More Than Two. Dogs May Not Weigh in Excess Of Seventy-Five (75) Pounds. Must Be Leashed.